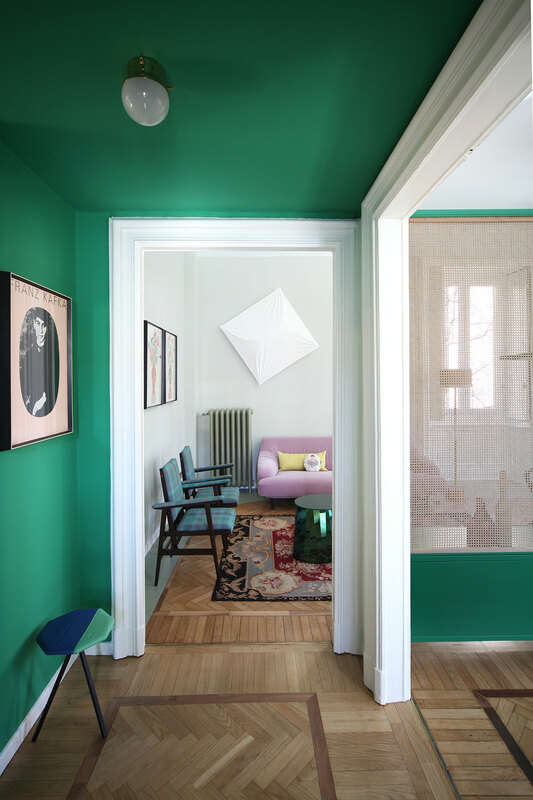 The renovation of a 150 square meter apartment in the center of Milan by architecture studio Marcante-Testa's Andrea Marcante and Adelaide Testa sees a space guided by contemporary reinterpretations of past memories. 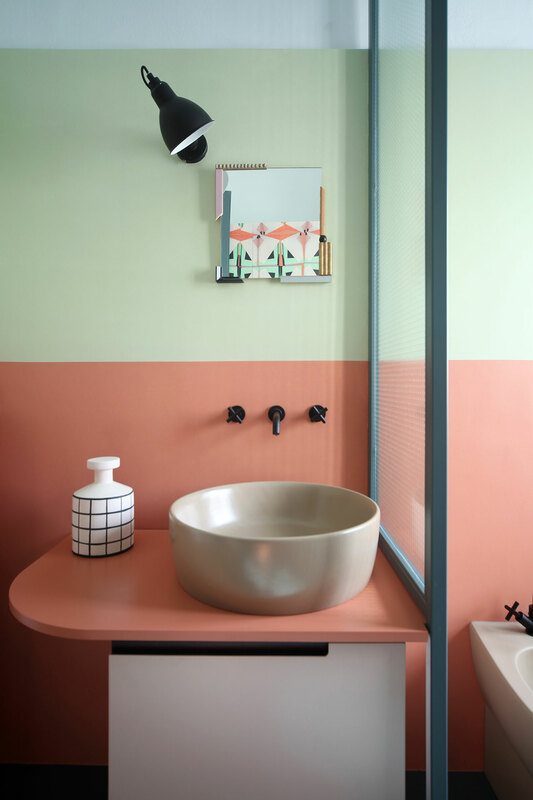 Completed in 2017, the "Le Temps Retrouvé" residence - as the project has been dubbed by the designers - is as much a part of the now as it is of a time gone by. 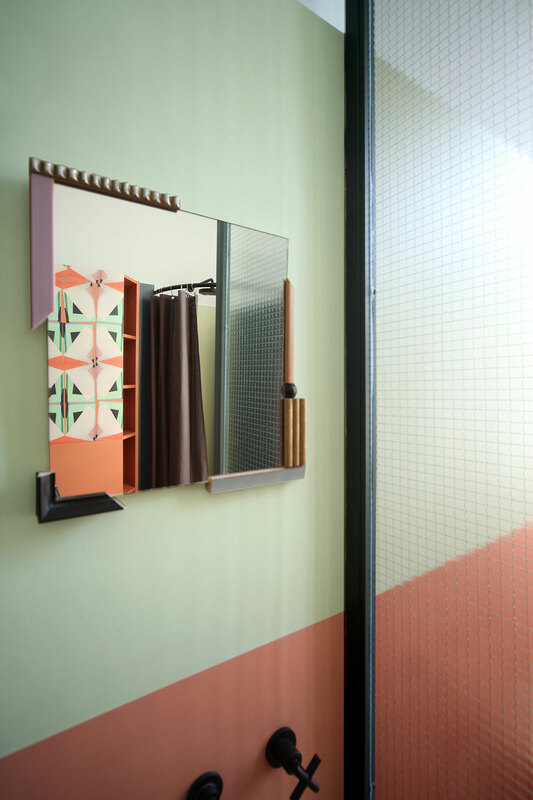 The key design factors at play are bold colors in retro tones, unexpected materials such as Vienna straw and wicker, and lively patterns juxtaposing monochromes. 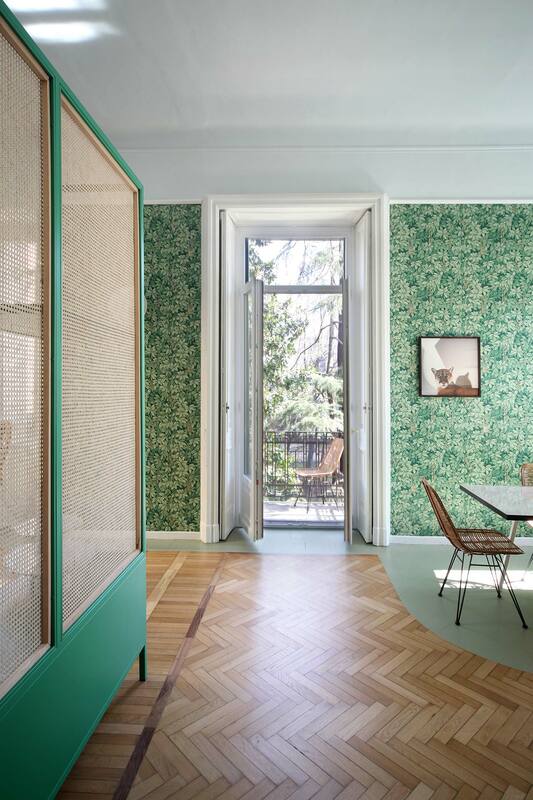 Nature and a reflection of nature is at the core of all this, not only thanks to the tall, light-filled windows facing the tree filled courtyard of the apartment building, but also due to the floral patterned wallpapers throughout the space that mirror this leafy context. 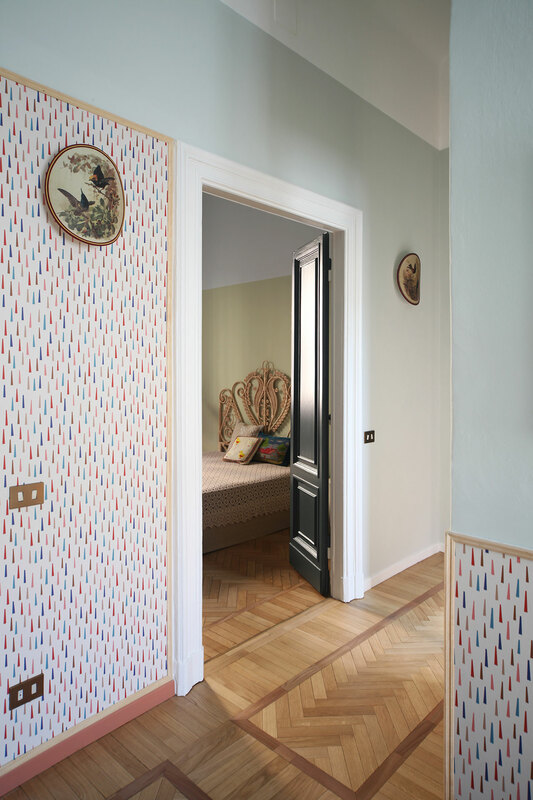 Family life can be enjoyed through a series of rooms that have been designed to appear almost "untouched" by time, as if they've been formed organically - perhaps even through a family inheritance which, if truth be told, is in fact a careful orchestration on the part of the designers who used many vintage and custom made items to achieve this look. 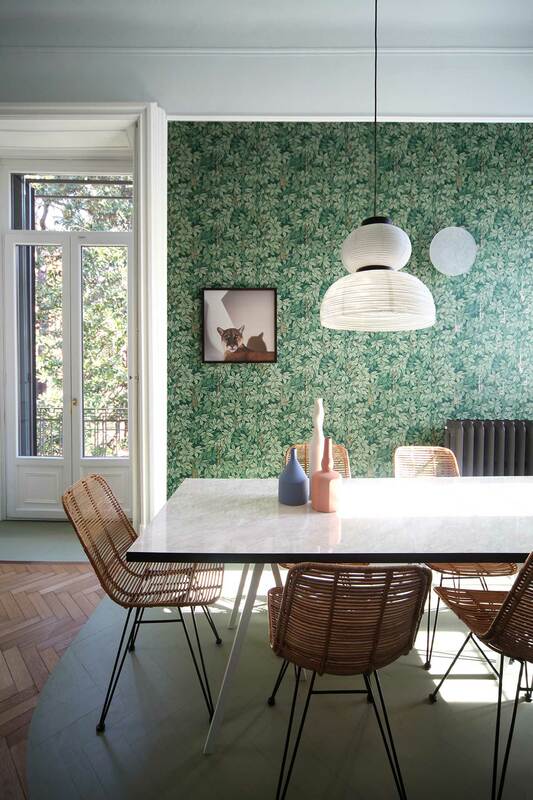 Take for instance the dining area and living room. 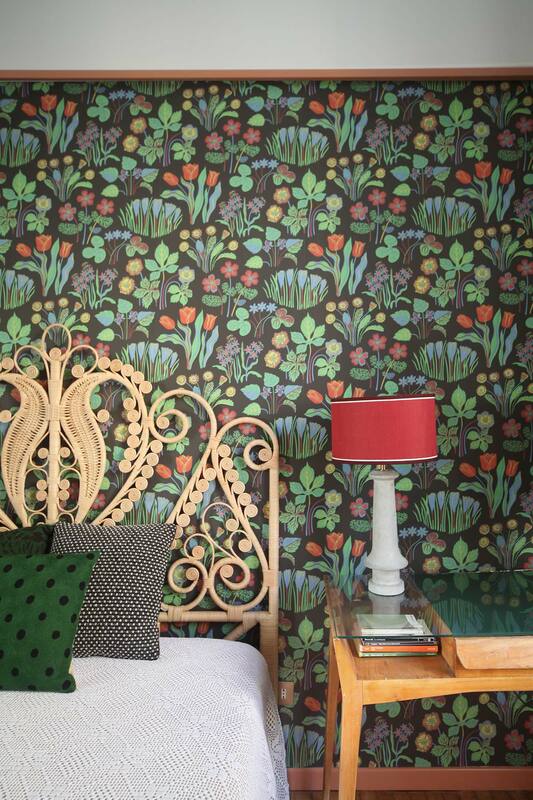 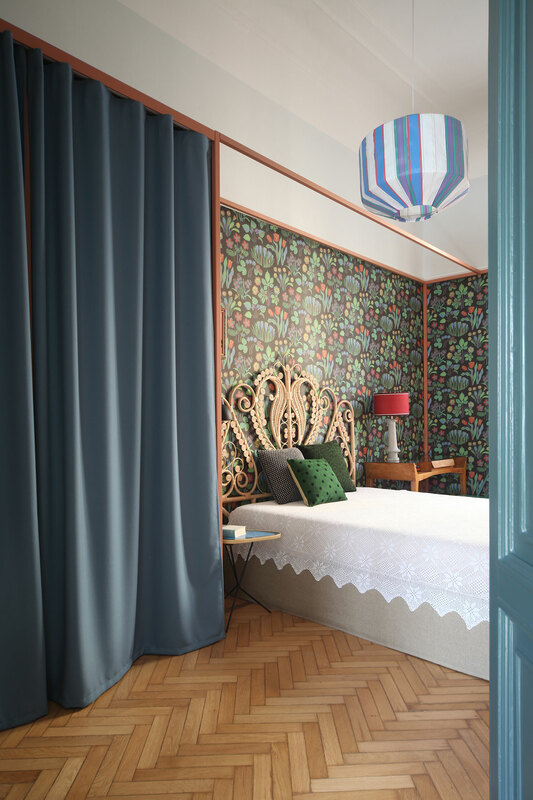 The lush and leafy "Chiavi Segrete" green wallpaper from the Fornasetti II collection by Cole & Son sheathing the large room unites the space and sets the background for its color scheme and theme. 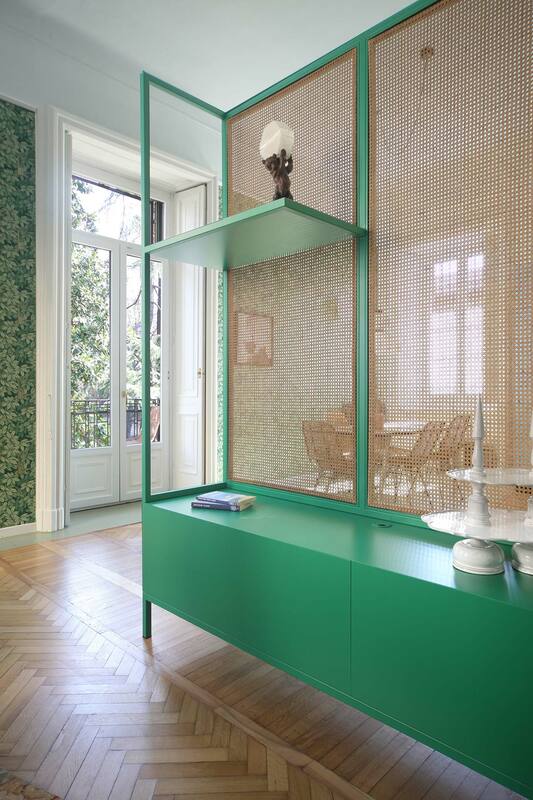 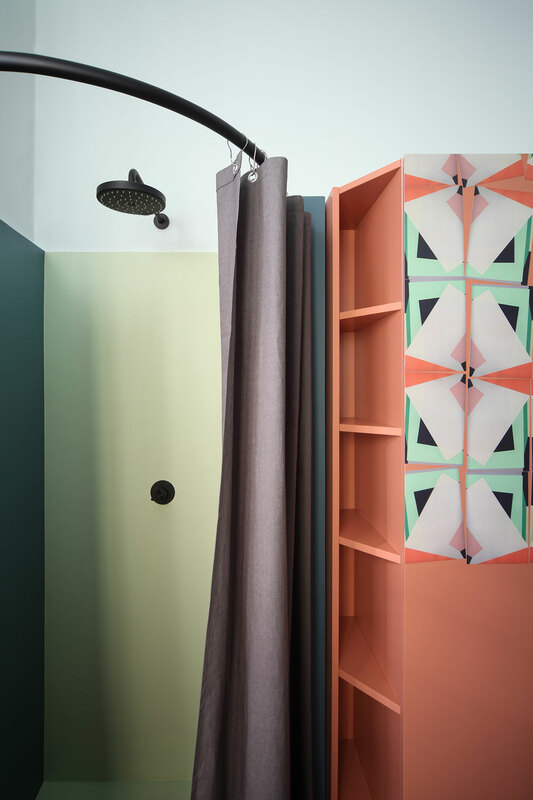 This includes a cabinet custom made out of lacquered MDF and Vienna straw - which also acts as a divider between the two dedicated spaces - and is painted an evocative, pale green color. 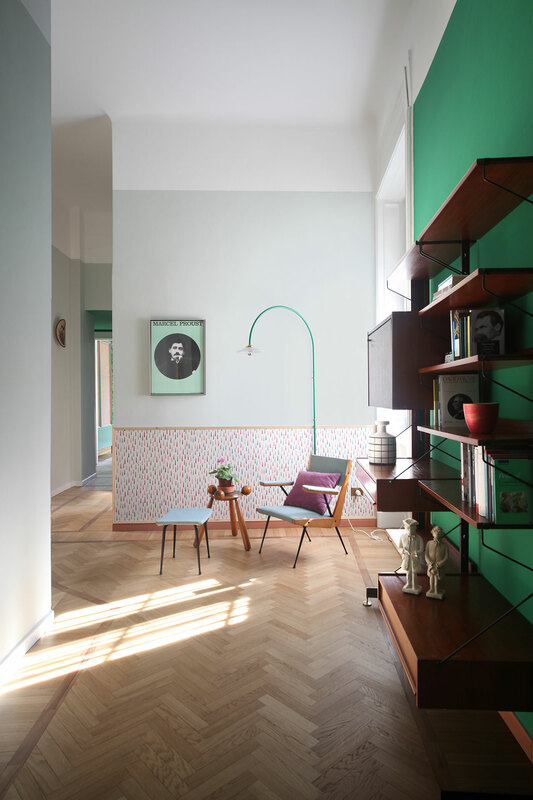 The herringbone wood floors boast a partial resin covering "highlighting" the space around the marble-effect laminate topped dining table - two more retro touches. 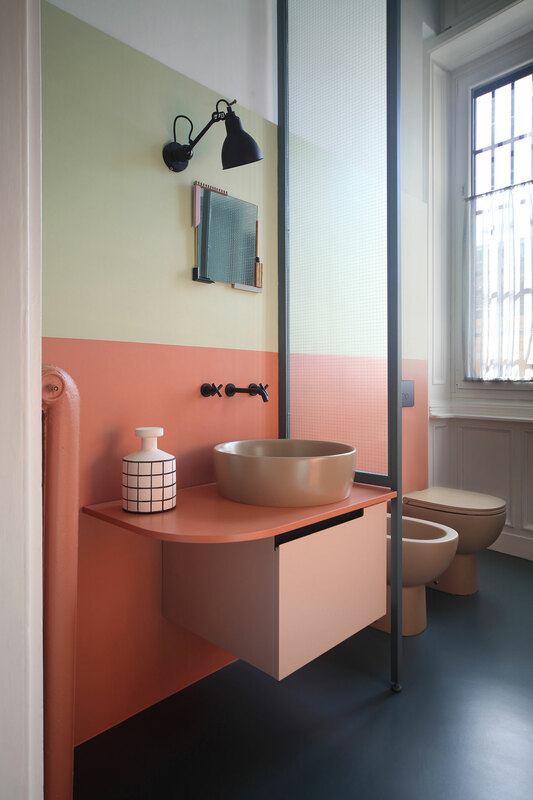 Meanwhile, the kitchen and bathroom furniture each feature strong colors, either blocking each other - for instance, in the bathroom's lacquered MDF items - or, as bold single strokes of color - such as in the kitchen's custom made cabinets. 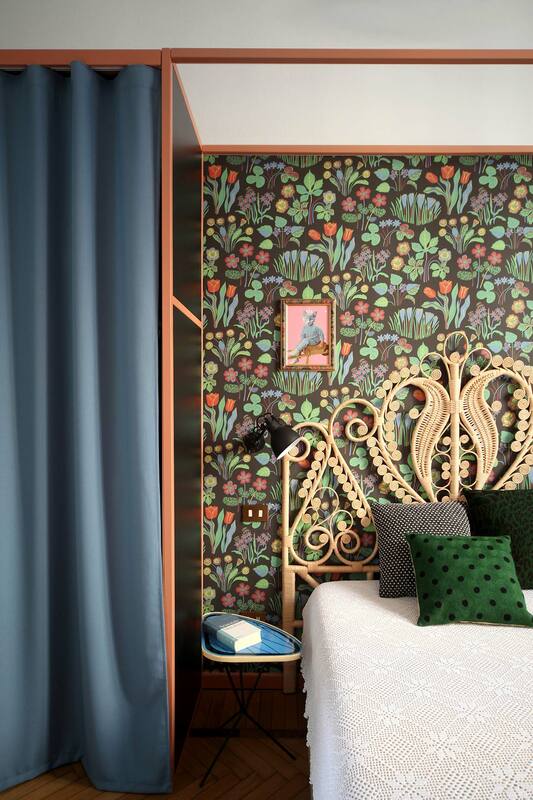 The bedrooms are more in tune with the living space's design direction, with energetic, floral wallpapers on one wall contrasted by single color walls facing them - in colors that pick up the tones in the wallpaper patterns - and old-timey touches such as the beds’ elaborate wicker headboards. 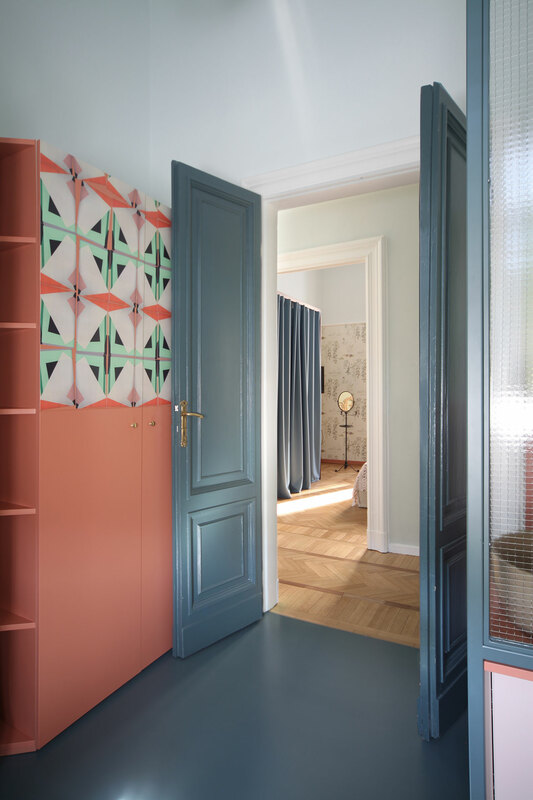 All in all, this is a space filled with timeless design character which was created to imbue humor, light and ease, enhancing the lives of whoever is lucky enough to turn the key in the front door, kick off their shoes and call this spot "home."